Three paintings from Elizabeth Taylor's personal art collection have been sold for £13.7m at an auction in London. The combined total of the Vincent Van Gogh, Edgar Degas and Claude Pissarro artworks fetched more than double the £6.2m estimate at the Christie's sale. 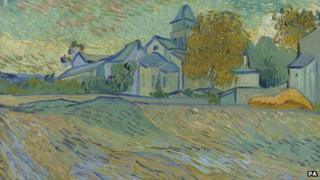 Van Gogh's Vue de l'asile et de la Chapelle de Saint-Remy (1889), fetched £10.1m, the highest price. Taylor's father originally bought the piece on her behalf in 1963 for £92,000. It had been hung on the star's living room wall in her Bel Air, California home until her death in March. The other two paintings, a self-portrait by Degas and a large-scale landscape by Pissarro - called Pommiers a Eragny - sold for £713,250 and £2.9m respectively. All three artworks featured in the global tour of highlights from the Collection of Elizabeth Taylor, which was displayed in both New York and London last autumn. A further sale will offer 35 works from the late film star's fine art collection on Wednesday. In December, a sale of Taylor's personal items such as jewellery, furniture and memorabilia, fetched $150m (£94m). The Oscar-winning actress died in Los Angeles last year at the age of 79.